Once upon a time down on an old farm, lived a duck family, and Mother Duck had been sitting on a clutch of new eggs. One nice morning, the eggs hatched and out popped six chirpy ducklings. But one egg was bigger than the rest, and it didn't hatch. Mother Duck couldn't recall laying that seventh egg. How did it get there? TOCK! TOCK! The little prisoner was pecking inside his shell. "Did I count the eggs wrongly?" Mother Duck wondered. But before she had time to think about it, the last egg finally hatched. A strange looking duckling with gray feathers that should have been yellow gazed at a worried mother. The ducklings grew quickly, but Mother Duck had a secret worry. Then one day, at sunrise, he ran away from the farmyard. He stopped at a pond and began to question all the other birds. "Do you know of any ducklings with gray feathers like mine?" But everyone shook their heads in scorn. "We don't know anyone as ugly as you." The ugly duckling did not lose heart, however, and kept on making inquiries. He went to another pond, where a pair of large geese gave him the same answer to his question. What's more, they warned him: "Don't stay here! Go away! It's dangerous. There are men with guns around here!" 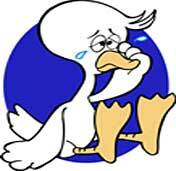 The duckling was sorry he had ever left the farmyard. Then one day, his travels took him near an old countrywoman's cottage. Thinking he was a stray goose, she caught him. "Just wait! If you don't lay eggs, the old woman will wring your neck and pop you into the pot!" And the cat chipped in: "Hee! Hee! I hope the woman cooks you, then I can gnaw at your bones!" The poor ugly duckling was so scared that he lost his appetite, though the old woman kept stuffing him with food and grumbling: "If you won't lay eggs, at least hurry up and get plump!" "Goodness! How I've changed! I hardly recognize myself!" The flight of swans winged north again and glided on to the pond. When the duckling saw them, he realized he was one of their kind, and soon made friends.